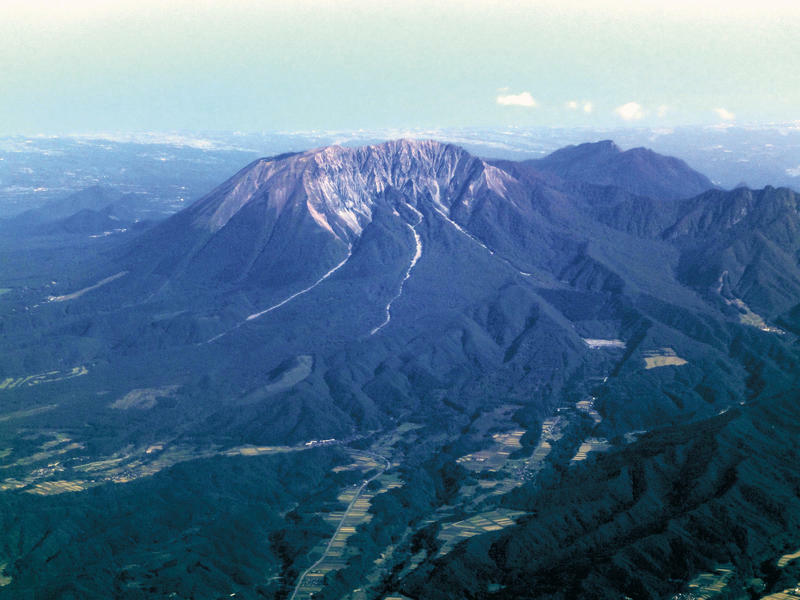 Daisen Volcano is a large Quaternary composite volcano (35 × 30 km) in the San-in district, SW Japan. The Misen Lava Dome, including Kengamine (1,729 m a.s.l. ), consist of dacite and its volume is the largest in Japan. This dome is accompanied with block and ash flow deposits at the foot. New 14C dating has revealed that the Misen eruption occurred at 28.6 ka. Obliqu air photo over the southern part of the volcano. Taken on October, 2014. Quantitative eruption history of Pleistocene Daisen Volcano, SW Japan. Diatom biostratigraphic age of a whale fossil occurred in the Horonitachibetsu River, Numata, Hokkaido. Daisen Volcano is a large dacitic composite volcano in the San-in district, SW Japan. This volcano has sometimes ejected wide-spreading pyroclastic fallouts along the Japanese islands during the Pleistocene time. The largest of them is the Daisen-Kurayoshi Pyroclastic Fall Deposit (DKP) at 60 ka. In this study, I revised quantitative eruption history of the volcano, because previous studies had involved stratigraphic and methodological problems. Firstly, there were different opinions about which the youngest product was the Misen Lava Dome or Sankoho one. New 14C dating has revealed that the Misen and Sankoho eruption occurred at 28.6 and 20.8 ka, respectively. Secondary, volumes of the pyroclastic fall deposits from this volcano were measured in the database of Suto et al. (2007, Bull. Geol. Surv. Japan, vol. 58, p. 337–352); they diagrammatically redraw the isopachs of the deposits in previous studies. However, their results ignored the distal distributions of the fallouts and underestimated the volumes of the deposits. So, the volumes of the pyroclastic fall deposits were newly determined by other methods using relationship between thicknes and area within an isopach. The revised quantitative eruptive history of the volcano since 210 ka shows that the magma discharge rate has increased at about 100 ka and DKP eruption took place during this high rate stage. Many occurences of fossil marine vertebrates and their age estimations have been reported from Numata Town, Hokkaido, Japan. Most of the fossil records are known from the upper part of the Horokaoshirarika Formation. The lower part of the formation has just a few reports so far. We examined fossil diatoms of a float rock with a fossil whale (NFL 2083; Numata Fossil Museum specimen), which probably is from the lower part of the formation. The diatom assemblage from NFL 2083 is assigned to the lower part of the Rouxia californica Zone (NPD7A, Yanagisawa and Akiba 1998; 7.7–6.8 Ma) based on the absence of Neodenticula kamtschatica, very rare occurrence of Thalassionema schraderi and occurrence of Nitzschia pliocena. Comparing the age to diatom biostratigraphic study in adjacent area, the determined age does not correspond to the age of the Horokaoshirarika Formation but correspond to the underlying Mashike Formation. This implies that there still remains unsolved problem on the stratigraphy of the studied area.